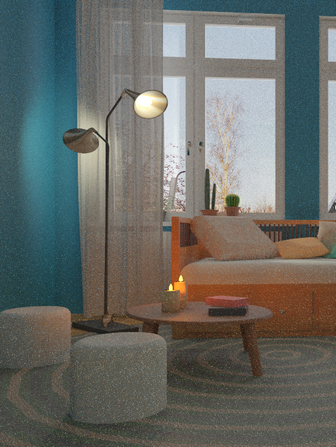 Left side: without Denoising, right side: Denoising activated. Note: Denoising requires a lot of working memory. Therefore, rendering images in high resolution can currently lead to instabilities. If you experience this behavior, please deactivate Denoising. The image preview will be shown faster. 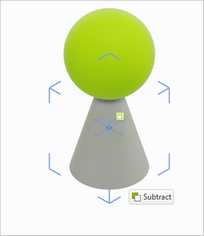 A green bar at the lower edge of the image preview will indicate the next time the image will be refreshed. In addition, notifications for the previous and remaining rendering time are more precise. • Stopping Condition: Custom is suitable for setting individual stopping conditions between the values High and Unlimited. • Keep Lines: Line Color allows you to set an individual color for outlines in the image. 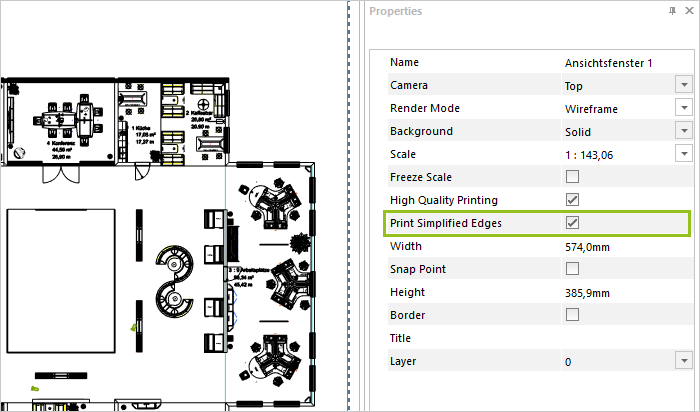 The new option Print Simplified Edges, found under the Properties Editor, controls the output of edges for individual viewports on the layout page. The option ensures quicker and more compact printouts and, as a result, smaller and quicker-to-view PDFs. In addition, the real-time rendering of dynamic outlines (silhouettes) within the plan has also been improved. This is dependent on your CPU. The more cores it has, the stronger this effect will be. • New door handle options: Various plates, recessed door handle, panic bar, etc. 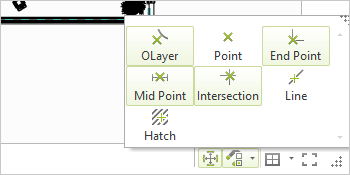 Under the Edit tab in the group Dimensioning, you will find a new tool for measuring angles within the plan. 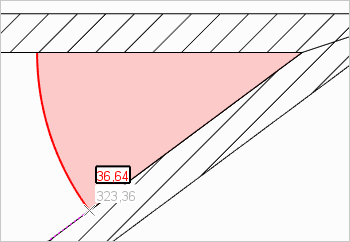 The measuring process will be visualized in the plan and the measured angle displayed. • When moving an object, all snapping modes are active at all times. 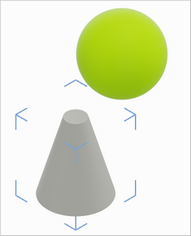 The object can be grabbed, for example, from the center of the line, the line’s end point, an intersection or by its hatch. This is also true when the option is disabled in the Snapping Mode dialog. • When releasing objects or using other actions, only the modes that are enabled in the Snapping Mode dialog will function. The dialog Snapping Mode (bottom right of the status bar) has been redesigned. 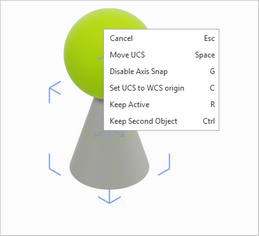 The options are displayed as a button and can be integrated into custom toolbars. The object interactor can now be placed by clicking on the SHIFT key and inner ring of the interactor in relation to its object. The toolbar on the right side of pCon.planner contains even more dialogs now. 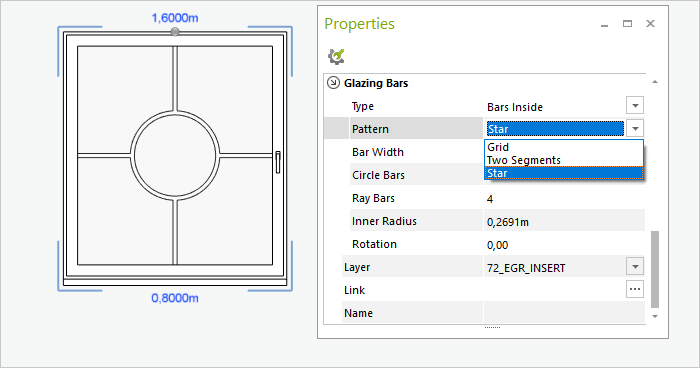 Conveniently open the Image dialog, Environment parameters and Layout area by clicking on the buttons on the toolbar. 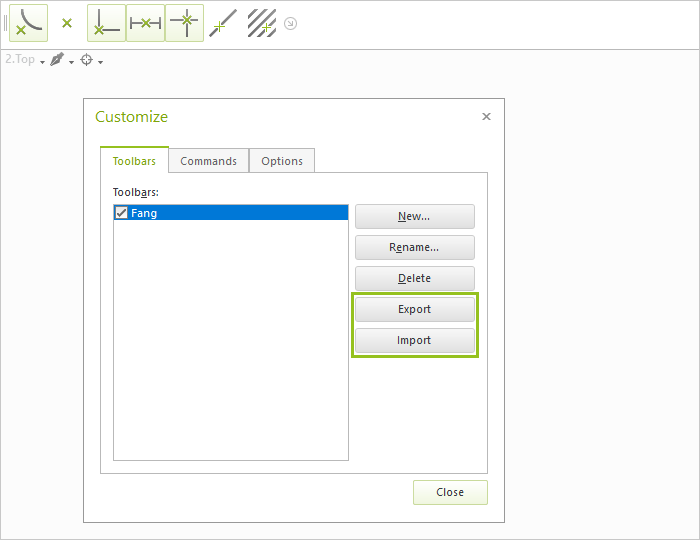 Individual toolbars can be imported and exported using the Customize dialog (File menu). 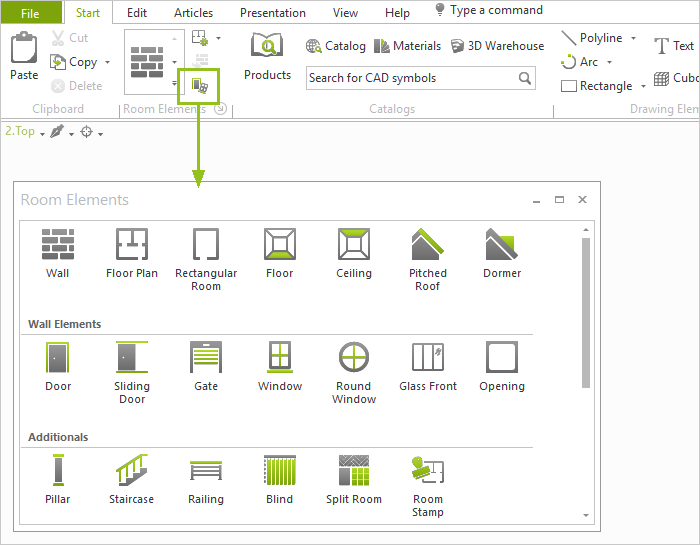 A new button under the Start tab in the Room Elements group will open a free-floating Room Elements dialog. With this, you can grab multiple objects in this category one after the other. 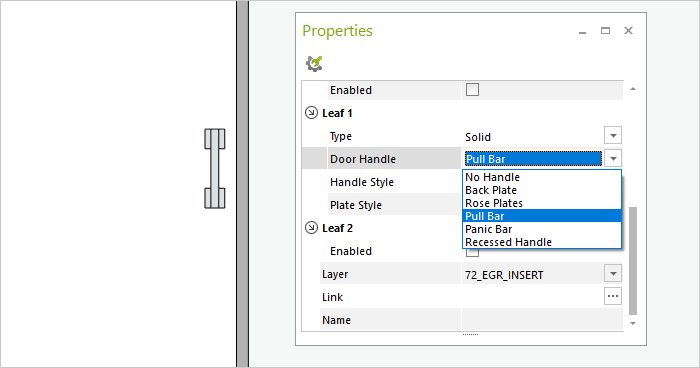 New options in the Material Editor affect the information content and improve its usability. 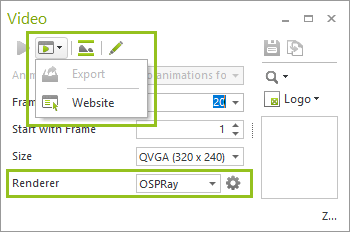 You will now find the option Ignore Line Weight in the PDF Import dialog. If this is enabled, the lines within the PDF will be loaded without predefined thicknesses. pCon.planner 8.1 supports the import and export of SketchUp 2019 format (*.skp). 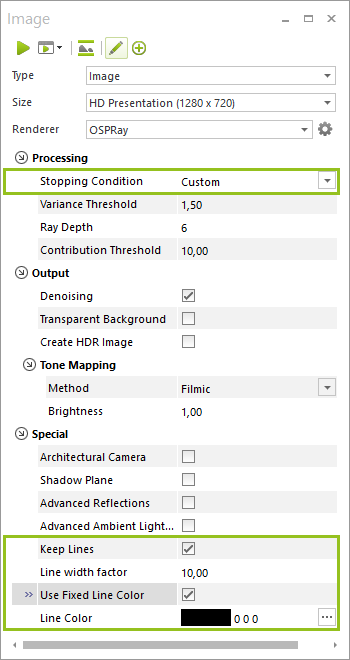 Image dialog: The image type Collage is outdated and is not included in pCon.planner 8.1. Article tab: The integrated configurator will be omitted from one of the upcoming versions of pCon.planner. If you have any questions, please contact Eastern Graphics support.